UPDATE: Mason Scott Cowden has been found safe, authorities said on March 21. The sheriff’s department did not release any information about how or where he was found. 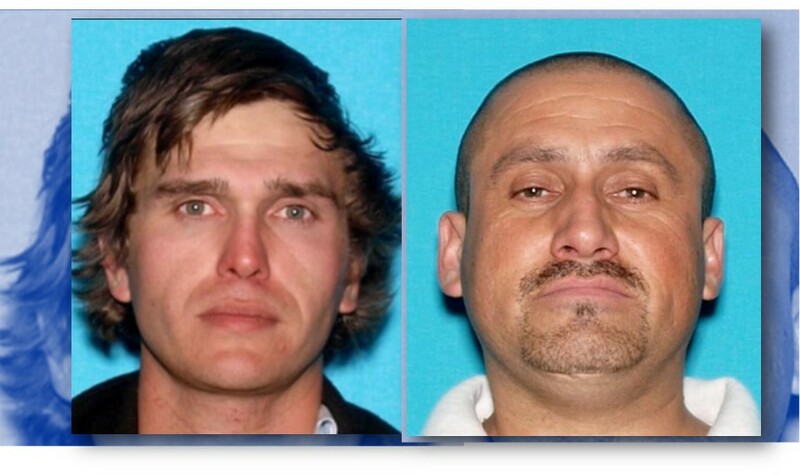 LANCASTER – Local detectives and worried family members are seeking the public’s help to find two men who went missing from the Antelope Valley and suffer from depression. Mason Scott Cowden, 26, was last seen on March 19 in the area of the 1300 block of West Avenue I in Lancaster, according to a news release from the Lancaster Sheriff’s Station. He is described as white, with blonde hair, green eyes and a scar on his left cheek. He is about 6 feet tall and weighs around 180 pounds. He was last seen wearing a white cowboy hat, black jacket, blue pants and cowboy boots. “Mr. Cowden suffers from depression and his friends and family are concerned for his well-being and asking for the public’s assistance in locating him,” the news release states. 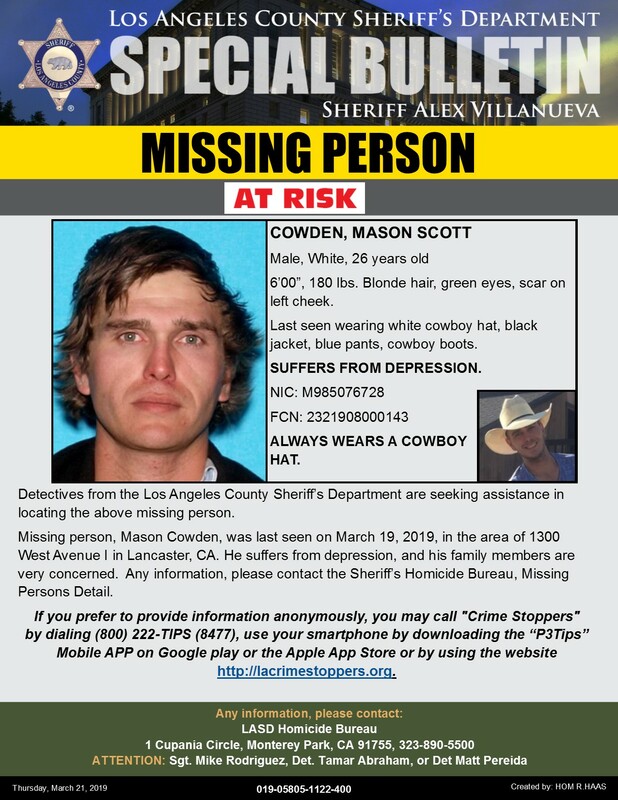 Anyone with information on the location of Mason Scott Cowden is encouraged to contact the Los Angeles County Sheriff’s Department’s Missing Persons Unit, Sergeant Mike Rodriguez, Detective Abraham or Detective Pereida at 323-890-5500. Carlos Cardenas, 42, was last seen on Feb. 20, 2019, according to a news release from the Sheriff’s Information Bureau. He is described as Hispanic, with a bald head and green eyes. He is about 6 feet 2 inches tall and weighs around 230 pounds. He was last seen wearing blue and white shorts and an unknown shirt. “Mr. Cadenas’ vehicle was last seen on Sunday, Feb. 24, 2019, in the city of Acton and recovered on Sunday, March 3, 2019. Mr. Cardenas suffers from depression, and his loved ones are asking for the public’s assistance in locating him, the news release states. 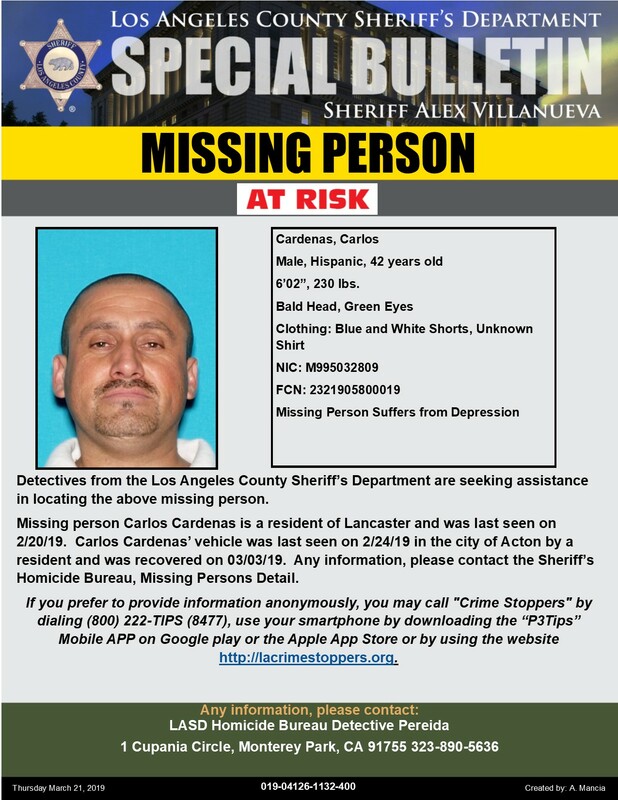 Anyone with information on the location of Carlos Cardenas is encouraged to contact the Los Angeles County Sheriff’s Department’s Missing Persons Unit, Sergeant Mike Rodriguez, Detective Abraham or Detective Pereida at (323) 890-5500. 3 comments for "Help local detectives find Mason Cowden, Carlos Cardenas [update: Cowden found safe]"
Last seen in acton and have been missing . Check angeles crest they probably went hiking and got lost. Hope they are found safe.